For Labor Day weekend, I joined a few mainland flying friends for a camp/fly trip to King Mountain, Idaho. Sadly, I had already bought my airline tix before the Air Raid date was announced, so had to miss that, although I would say it was a worthy trade-off. Saturday, an HG pilot friend, John, and I arrived and met some of the Intermountain League pilots during the midday. Several of them said it was too strong and that they would be coming back for glassoff later. There were a couple of PGs in the air. I believe one took off for XC over the valley to escape the stronger conditions over King. I opted to wait for the glassoff. John and I proceeded to the HG launch, from where he had a nice 40 minute flight in good, but not epic thermals. Upon returning to the PG launch around 5:30 pm, we found many pilots (~10) lounging waiting for the wind to die down. I introduced myself and pumped as much information from them as I could. My first King glassoff flight -- SWEET! While waiting for the strong conditions to subside, there were several periods where the winds calmed, but still the League pilots waited until about 6:30 pm when lighter cycles finally prevailed more consistently. About 7 of the pilots launched and went to the peak of King quickly. After waiting to hear reports of the conditions from those in the air, I launched. I took the flight cautiously at first, repeatedly checking my forward penetration as I benched up the face of King. The racers had taken off on XC before I reached the summit, but I was able to see the path they had taken and eventually followed. I had a nice gentle XC flight hovering over the ridge's face at about 11,000 feet down to about the middle of the Sunset Ridge, from where I left to land before the sun went down. Landing was fun with my retrieve chasing and checking out the LZs for me, enabling me to stay up as long as possible in the waning light. My GPS log is here. On Sunday, we were joined by two more HG pilots, and on our way to their launch in the morning, we ran into a car-ful of League pilots. Unhappy with the strong mid-afternoon conditions of the previous day, they were heading down to Big Southern Butte. I was tempted to go with them, but preferred to hang around for another shot at the glassoff and to watch the HGs fly the midday carnival. Up at the HG launch, conditions were initially light and mellow, and I even "considered" launching, but I decided to wait and see how the hangies did. The first to launch, Liz, an H2 pilot, took a short, but sweet flight to the regular hang LZ. As the others prepared to launch, the cycles became stronger and with more cross cycles, and I knew the calm morning was over. The other two HGs (John and Sam) were soon coring thermals all over the place. On the way down the hill, I checked out the PG launch, and though the air seemed launchable (14-18 mph) I figured it would mean the the lift would be strong, and that the LZ's would be hot and dangerous. Sure enough, later when the last HG came in to land, the winds in the hang LZ were averaging about 10, but with long gusting cycles over 20 mph. Around 5:45, we returned up the hill to look for the lighter conditions of what we hoped would be a nice glassoff. This day, there was alot more moisture in the areas north and south of the valley. I wondered if this day might have been a stronger day than Saturday, and or that there was perhaps different weather in the air. I found four pilots at the PG launch. Mike and Kathy were P2s who had been taking sled rides in morning conditions, but were wisely cautious in the afternoon. P4s Damion and Neil clearly were more experienced and well-versed in inland-mountain flying (though admittedly new to King). The air on launch was still about as strong as it had been when I last saw it in the early afternoon. While we waited, Damion wowed us and Neil's video camera with excellent "acro-kiting". He made the strong winds look gentle with much hovering and swooping around the launch area. He finally let himself be lifted and was soon high above. From the ground it appeared that he moved forward comfortably. Meanwhile, I grilled Neil on his assessment and concerns about the conditions. We had experienced at least a few periods of comfortable air (10-14 mph) lasting about five minutes each. And after each one ended, and the air returned to the stronger conditions (14-18 mph) someone would joke "That was our window, we should have launched!" We were hoping for some magical time when the wind conditions would "switch" down to the lighter glass-off like we had experienced the previous evening, but we were cognizant, at least so far, that we hadn't yet reached that time. I quizzed Neil about the possibility of the conditions never waning, and he assured me that that could be quite possible with the vast Snake River plain cooking enough heat to feed the thermal motor of King all night. Neil seemed very wary of the conditions. I was eager to fly, certain in my hope/belief that the conditions would mellow. I fear now that my unbounded enthusiasm to fly may have been contagious and influenced Neil to step out of his bounds. Up in the air, the HGs were reporting smooth gentle conditions and were encouraging the H2 to launch. During the next light period Neil setup to launch, and I followed. Initially, I found little lift, and had to work light lift close to the hill over the spine to the right (north) of launch. I did not see Neil launch, or where he got his lift, but he was soon well above and to the SE of me, closer to the main mountain. After scratching hard over the spine to the right of launch, I decided that I was high enough and that I ought move away from the spine where I felt vulnerable to the SW winds pushing me over the top and that I should explore the air back in front of launch. As I reached the area in front of launch, my ground speed dropped to 2-3 mph. I pushed speedbar to increase it to 6-7 mph. Soon, I saw Neil coming down with big ears (and I will presume speed bar). I decided I should heed his warning and soon followed suit. He descended more rapidly than me and within a few minutes was below and ahead of me. At some point he let out the ears and appeared to be flying smoothly with good penetration. He appeared to be pushing out to the LZ (over a mile away) flying over the gully to the LZ but drifting to the right toward the spine. I maintained my big ears/speed bar for awhile and at one point as I followed Neil I experienced massive sink, getting 800+ fpm down with some turbulance. I rode this out then released the bar and ears. 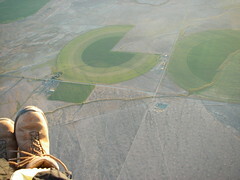 Neil was at about 600 ft AGL when his glider suffered a deflation. I saw a collapse, and then about two turns of an ugly spiral dive. The glider stopped spiralling, but just continued to go through a series of deformations with the pilot's body swinging out to all various sides. As I and my glider soon came just over and slightly downwind of Neil, I took a collapse and small surge. My wing recovered from these and I was able to keep the wing open and overhead through the remaining few seconds while I was battered around. Meanwhile, Neil and his glider continued to descend with disorganized activity. I kept watching to see the glider recover, or to see the parachute come out. I did not. I would estimate that he kept falling for at least 10 seconds, maybe more. I stuck around long enough to report as much as I could to the ground crew then skirted out over the low front of the spine. The pilot impacted the shallow slope almost simultaneous with his glider and reserve. I did not see the reserve prior to impact. After impact, it lay on the ground about 8 feet away. 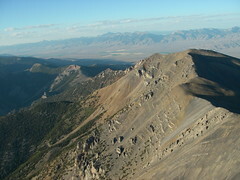 I felt no more turbulance as I moved away from the canyon and landed in the flats in 20 mph winds. It took awhile to recover the downed pilot from the remote location and get him airlifted to good medical attention in Utah. At last report, Neil's had some surgery to tie together some broken bones and is hoping to be flying Valle de Bravo in January. In post-flight discussions with the hang glider pilots, it seems that about the time Neil and I were starting to descend with big ears/bar, one pilot was in 200 fpm lift, while two other pilots were in two distinct thermals with 1800-2400 fpm lift. Two HG pilots remaining on launch reported development of strong winds 90 degree cross, which made breaking down difficult as they chose not to fly. It seems clear to me that conditions had changed, and far beyond the milder periodic increases we were experiencing on the PG launch. I think in the stronger winds, the hill in front of King became a more significant factor contributing rotor to the mix of thermals and wind. Chad Bastian wrote a great web report about the 1997 Nationals. It mentioned one guy trying to use B-line to go down in windy conditions, and paying for it by going backwards. I remembered that as I chose the big ears/speed bar option to come down. King Mountain is a big, beautiful place to fly. But it demands your respect. If you're thinking of going there or anywhere with such big air, please do your best to get local site guidance. It's not a guarantee of a safe flight, but locals know the weather patterns that we island pilots don't see much. Or better yet, go when there's a well organized comp going on. that sounds scary. Do you recall whether Neil was stillin Big Ears when he had his collapse? In Valle De Bravo Marge had a collapse while in Big Ears in turbulent air and spiraled hard into the ground (needed surgery to patch broken bones and stitches)... Do you know whether Neil is the same Neil who was this year in Valle de Bravo with Rob Sporrers group? Great report, Sandy! (I made some edits to the article just now, mostly just removing some unnecessary P and DIV tags.) And your pictures are gorgeous. That terrain reminds me of Lakeview, except maybe prettier. It sure sounds like it was an exciting trip. I still can't believe you snuck off to the Intermountain League meet without telling anyone. You are just a closet comp maven! Glad to hear Neil will recover okay. I hope you will consider sharing your report on the online USHPA accident report form, so it will be available for possible further analysis in the magazine and be counted in our annual statistical compilation. Christine, I am fairly certain Neil was not in Big Ears when the collapse occurred. He was probably on bar though. When I hit the massive, slightly bumpy sink while in Big Ears, I decided to hold them because I didn't want any unpredictability and/or a situation promoting rotation. I just used weightshift to try to keep it as stable as possible, and it felt okay (but I'm not saying this was the right thing to do, just worked out okay for me in this instance). It's very possible Neil is the same you met in VDB last year, as Damion said it was a regular event for them. Alex, your official report is on the way. Believe it or not, I edited this story down from a longer version =:-O Happy editing!